The Chinese sure seem to know how to make dozens of starch variations using rice. Aside from white rice, there are rice noodles, rice noodle sheets, edible rice paper, rice milk, rice flour, glutinous rice and its various incarnations. One particular product, made from glutinous rice flour, you may have heard of – the nian gao. It's a sticky, chewy, popular dessert for celebrating Chinese New Year. A variation of the nian gao is a long log made out of glutinous rice flour and water, which is sliced on the diagonal to achieve thin oval slices, commonly known as "rice ovals" in English, but still called "nian gao" in Chinese. These rice ovals have no flavoring, but are an opaque white color and have a distinctive chew to them. They are usually sold pre-cut and either partially or completely dried, to be reconstituted in water before using. Rice ovals are used in a variety of dishes and soups in Chinese cuisine. 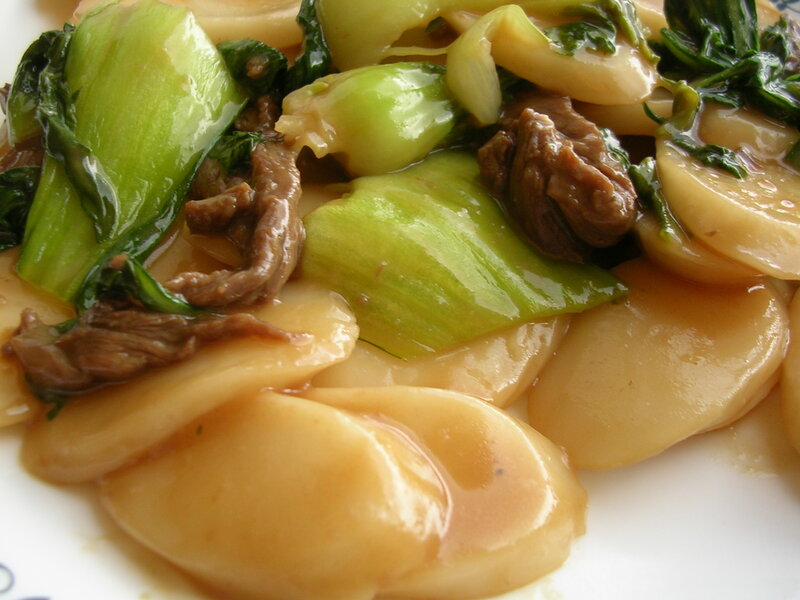 One of its most popular uses is in Shanghainese cuisine, where they are stir fried with sliced meats and vegetables in a clear sauce. My mom makes a lot of great authentic Shanghainese food at home, and she likes to make stir fried rice ovals with a brown sauce (which is called "red braised" in Chinese, even though they're not red nor braised in this dish haha). When cooked properly, rice ovals are uniquely chewy but also soft, which is an interesting way to vary the starch in the dish. The brown sauce is made thickly so that it coats the rice ovals generously, and gives them a lot of wonderful color and flavor. 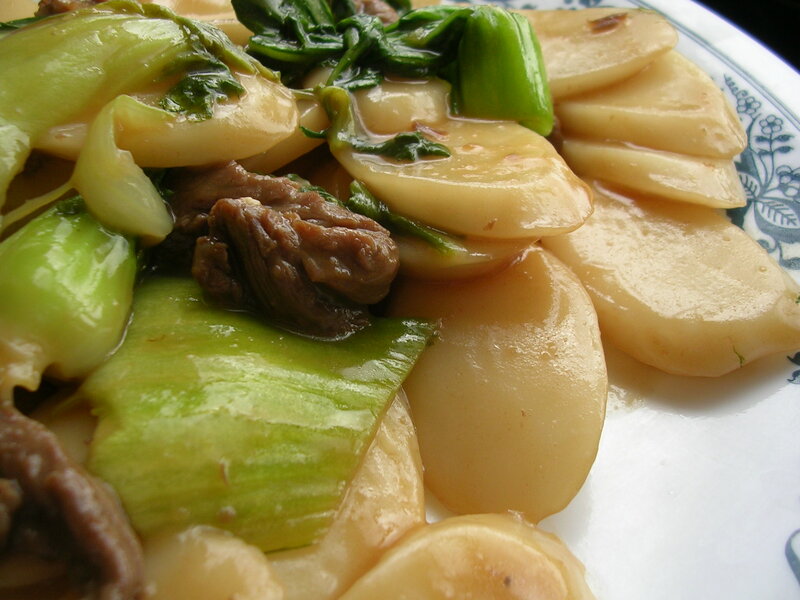 It's one of my favorite Shanghainese dishes, and it always reminds me of home when I think of it. Since today also happens to be Mother's Day, this recipe is my tribute to my mom's home cooking. She inspires me as a cook, and I am always amazed at how there is nothing that tastes quite like a mother's cooking, made with love and care. A woman who has made countless delicious dishes, who cannot write down a recipe for a single dish… that is a woman who knows how to cook with her heart, to harmonize ingredients rather than to follow a list of instructions. This recipe is made with a package of partially dried rice ovals that I got from a Korean market, also available at most Asian markets. I made red braised rice ovals with beef and Shanghai bok choy (you don't get much more Shanghainese than that!). There is really no difference between using partially dried and fully dried rice ovals other than in preparation, so if you happen to get fully dried rice ovals (they'll be dry and hard, like little oval plastic chips), soak them in a container full of cold water overnight before using them. Otherwise, if using partially dried ovals, they just need to be boiled prior to stir frying. 1. Marinate sliced beef in soy sauce, white pepper, rice wine, and cornstarch, for about 15 minutes. 2. Bring a pot of water to boil. Place rice ovals in water for 6-10 minutes, until soft and chewy. In my case, I dumped the whole 2 lbs into a small pot of water and it didn't really come back to a boil, but after about 10 minutes they were done. Rinse with cold water, drain, and toss with a little vegetable oil to prevent sticking. Set aside. 3. In a hot skillet with vegetable oil, stir fry bok choy with a few pinches of salt until soft but still a little bit crunchy, about 5 minutes. Remove from skillet. 4. Now sear the beef on each side until almost cooked through. Turn the heat down to medium. 5. Add the boiled rice ovals to the skillet, add soy sauce and oyster sauce (I can't tell you how much I ultimately used, but maybe start with 1/2 tbsp soy and 2 tbsp oyster sauce first, and add as needed), and stir around to coat rice ovals evenly. Try to separate the ovals that are stuck together. 6. Add the cooked bok choy back to the skillet and mix everything together. Heat through and adjust for taste by adding more oyster sauce as needed. The final sauce should be thick enough to stick to the rice ovals. Serve immediately, and store the rest in an airtight container, reheating in a microwave until it is hot all the way through before serving again to avoid hard rice ovals. This entry was posted on Monday, May 12th, 2008 at 2:44 am	and posted in Chinese, cooking, recipes, Uncategorized. You can follow any responses to this entry through the RSS 2.0 feed. I really want to make this, it looks divine. I was wondering though, if you could reccomend something other than rice ovals to go in it as I haven't been able to find those here. I can find white rice, brown rice, calrose rice, and rice noodles or sticks. How do you think one of those would do? My kids LOVE rice. I love that the sauce looks easy and doesn't require too many ingredients! I am DESPERATELY looking for more asian recipes like this because I am wearing a path in the pavement going from my house to my favorite chinese takeout place. I think the rice noodles or sticks would go just fine as a replacements. I'd prepare the noodles ahead of time by soaking them in hot water for a few minutes until soft, and then stir fry in your skillet with some oil and the sauce ingredients until they are edible, then combine with the cooked meat and veggies. Unlike the rice ovals, rice noodles tend to soak up the sauce and be very flavorful, so start with less sauce and add it as you need :) You'll want to add some water to the noodles in your skillet if they start to become too dry and sticky while they cook… it's pretty forgiving though!